Oriental Beauty Oolong is a tea invented in Taiwan, in the Hsin Chu area, during the Japanese occupation era (1895-1945). 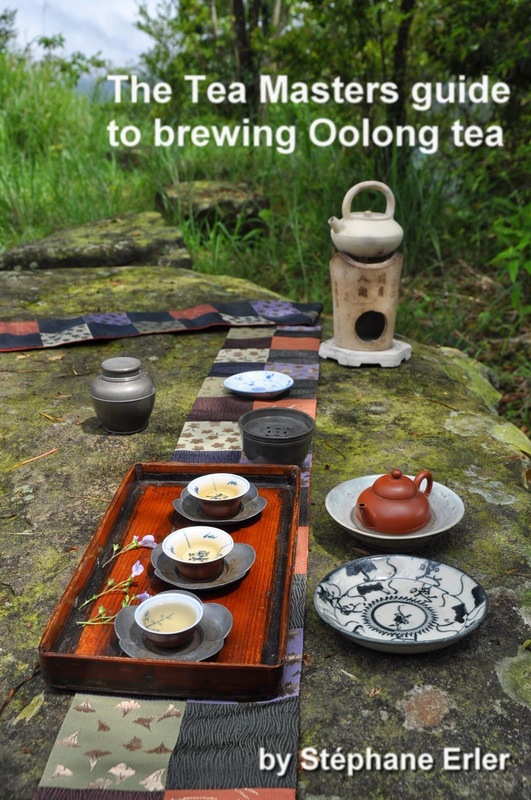 It has become one of the most famous Formosa Oolongs along Dong Ding Oolong, Gao Shan cha and Wenshan Baozhong. And if there's one rule in the tea business, it's that famous, expensive teas are copied and imitated in places where costs are lower. In 2006, I already tasted 3 OBs of different origins. Let's taste again the difference and see what we can learn from comparing an OB from Taiwan and one from overseas. A Taiwanese tea farmer with international connections sold me several samples so that my readers and I can better understand what OB not from Taiwan tastes like. He told me that such cheaper, foreign OBs are often sold in Taiwan, especially in supermarkets or in tourist places where consumers are price sensitive. The dry leaves look very similar to Taiwanese OB. I still remember that, in 2006, the sample I tasted had lots of white buds, but in this one the ratio of buds to leaves similar to the Taiwanese OB below. The difference we can see is that the color is slightly lighter. In terms of smell, the scents of my Taiwanese OB are darker, mature and deep. The brew's color is also much darker. But both have a good transparency. The taste and scents end up being much more different than the picture of the dry leaves would presume. The overseas OB has fresh, bright scents, but a rather flat taste. My OB, on the end, has these dark, sweet aromas and a very rich taste and aftertaste. The open leaves show that the process of these 2 OBs is very different. The overseas OB is meant to be cheap and popular. That's why we can see that its oxidation is relatively light (for an OB) and it's not roasted. This is what produces the lighter color and the fresher fragrances. To be fair, I must say that I'm quite impressed by how close it comes to similarly processed OBs in the Hsin Chu area. There also, some farmers go with the current trend of lighter oxidation and a lack of roasting. The leaves of my OB tradition point to both a higher oxidation and a medium roast. These 2 processes (oxidation and roasting) require time and this (also) explains why the price is higher. In conclusion, I find this kind of OB more interesting, sweeter and longer lasting! For me this Oriental Beauty has depth and one more dimension! Of course, this assessment is also personal and depends on your own tastes and experience. So, in order to help broaden your experience, I will include a free sample (5 gr) of this overseas OB for any order that includes at least 30 USD of any of my Hsin Chu OBs (you can find various OBs in the jassid bitten and the aged Oolong categories). (I have 60 samples to give away on a first come first serve basis. 1 free sample by order only). Tang dynasty beauty. National Palace Museum. Cette expo se déroule actuellement au Musée du Palais National de Taipei. Elle est très intéressante, car elle montre les échanges commerciaux du 17ème siècle au travers la porcelaine, notamment. Pour cette vision internationale, on a regroupé des objets issus du musée de Taipei, du Rijksmuseum d'Amsterdam et de 2 musées japonais. Teaparker nous a servi de guide pour cette visite. On s'est donc surtout concentré sur tout ce qui a trait au thé! Remarquons que cette peinture est fidèle au thé qu'on buvait à la fin des Ming et au début des Qing: le thé vert était préparé dans des grandes théières et versé dans des grandes coupes. Vous remarquerez que la partie blanche de la porcelaine est un peu jaune ou rouge. Cette coupe, par contre, a une porcelaine d'une couleur immaculée. C'est cela qui fit la réputation de Jingdezhen à cette époque. On parlait alors d'or blanc, tellement sa porcelaine était chère. C'est à partir de ce croquis qu'on fit cette assiette à Jingdezhen. Il est intéressant de voir la sinisation des traits des femmes et le changement d'apparence des oiseaux. En bonus, je vous laisse avec ce bol qinghua décoré avec des joueurs de go qui boivent du thé! In 2003, the puerh market wasn't regulated and the easiest way to sell puerh for new private factories was to use the same wrapping and packaging as in the past. On the neifei, it is mentioned Menghai Factory, but this isn't the case. From the slighthly lighter color of the buds, we can see that this cake is slightly younger as the one on the right. This cake was commissioned by the CNNP and made by Menghai Tea Factory. That's why the neifei states CNNP. (During the communist/monopoly era, 1950-2000, the CNNP owned all the tea factories but there was no factory named CNNP). But there is no real doubt that the CNNP asked the cake expert, Menghai Tea Factory, to produce this cake. The quality of the leaves and several other details point in the same direction. But it's in part because it's not written Menghai that its price is actually very attractive compared to other 7542 cakes on the market. And also because I could purchase it in Taiwan in 2014 from someone owned the cakes for a long time. 1. The 2003 small private factory raw puerh cake. This cake is easy to flake. It's also available in a sample size of 25 gr (6.95 USD). The main difference with the 1999 cake is the leaves. We see much fewer buds. And most of these leaves are plantation puerh. This isn't so obvious when you look at the cakes. The best way to brew this puerh is with a normal to generous amount of leaves, an Yixing zisha teapot (not a zhuni), a slow pour and short brewing times. The brew is dark brown, but not black. It has a good transparency and color. The scent is what's best with this puerh. It comes very close to an aged 8582. These darker and heavier seem older, because this puerh had a more humid storage than the 7542. But it's not a ripe, cooked puerh. For this, the brew isn't dark enough and the wet leaves are not cooked (see below the last pic of this tea). For a detailed review of this tea, I recommend reading MattCha's blog post. Its woody scents and clean mouthfeel are a very good introduction to the world of aged puerh and a good choice for such an everyday tea. The brew is getting a lighter hue at the end. And we can see that the leaves are not burned in the manner of cooked puerh. That's why this tea retains some coolness and freshness. In conclusion, this is the cheapest puerh of my selection and one of the Best Buy! The other Best Buy puerh is the 1999 Menghai 7542 raw puerh cake commissioned by the CNNP. This tea is also available in sample size so that you can taste it and see how you like it before purchasing a whole cake (29 USD for 20 gr). The 7542 Menghai Factory cake is the successor of the Luyin, green mark puerh. Many say that the red mark is the best cake of that era, as it predates the green mark and is more expensive. However, according to Teaparker (who has often tasted both), the Luyin/green mark is superior. The green mark uses smaller leaves and more buds than the red mark and this adds finesse to its taste and aftertaste. I'm using the same teapot, ivory porcelain cups, water and kettle for this tea, so that I can compare them. However, I'm not brewing this puerh exactly the same way. Thanks to its high concentration of aromas in the buds, I'm using fewer leaves and therefore I brew them a little bit longer. The brew has a rich brown color and a complete lack of turbidity. It shines. And the result is delicious, because it combines the fresh energy of raw puerh, the woody and incense scents of aged puerh and the smooth refinement of aging. It coats the whole mouth in a clean and luscious way and it resonates for a long, long time. This takes the aged puerh to another level, but it's interesting how close both scents come. It's just that the youth and energy of this 20 years old puerh is much better preserved. The explanation comes from the wet leaves. Below, we can see that the 1999 puerh (right) have a lighter color. This indicates a drier storage. (The other reason for the concentration was the higher proportion of buds). At slightly more than 1 USD per gram, a price often exceeded by good quality new puerhs, this 20 year old cake is really another Best Buy in my selection! Note: if you're looking for a third puerh Best Buy, I recommend the 2003 wild Yiwu cake. This is a puerh I've selected at the start of my tea adventures, 15 years ago! I've stored it in my Taipei apartment ever since. At 495 USD per cake (500 gr), its price per gram is cheaper than the 1999 '7542' and cheaper than many new wild raw puerhs! And it has already been very well aged in Taiwan's climate! Ces vacances du Nouvel An Chinois tombèrent bien pour moi pour lire le nouveau livre de Michel Houellebecq, Sérotonine. Sans trop divulguer de l'histoire, ce roman n'est pas très joyeux. Il raconte l'histoire d'un Français de 46 ans (2 ans de moins que moi), diplômé d'une bonne école de l'enseignement supérieur (pareil) et qui a connu une succession d'histoires d'amour avec des hauts et des fins malheureuses (qui n'en a pas connu à un moment de sa vie?). Il devient dépressif et a besoin de prendre un médicament pour lui apporter la sérotonine nécessaire à son vague à l'âme. Malgré ce résumé pas bien gai, ce livre se lit très facilement et avec un certain plaisir, car il nous permet de mieux comprendre l'état d'esprit de notre époque et comment fonctionne, ou plutôt comment ne fonctionne plus la société française. Et pourtant, le narrateur devrait tout avoir pour être heureux. Il est un haut fonctionnaire bien payé et vit dans un certain luxe. Mais il se rend compte que son boulot n'a pas d'impact positif pour ceux qu'il est censé aider et, de tout de façon sa carrière l'intéresse moins que sa vie sentimentale. Or, il pense avoir raté le coche pour se marier et fonder une famille. Le roman commence par la prise de ce médicament le matin, en même tant que la tasse de café et la cigarette! Ces trois substances semblent bien aller ensemble. On passe d'une addiction légère à une autre, de plus en plus dure. La cigarette a pour effet de détruire les papilles. Elle oblige à déguster des boisssons au goût très prononcé, comme le café, de préférence serré, pour faire un effet. Certes, le thé contient aussi un excitant un peu addictif, la théine. En fait, d'un point de vue chimique, c'est exactement comme de la caféine. Mais le thé, bien compris et bien pratiqué, ne nous entraine pas sur un chemin de la destruction, mais sur celui de la beauté et de la vie! J'en veux pour preuve ou pour exemple mon blog. Le thé est, par essence, un produit semi-fini très sensible à la manière dont on le prépare. Il va y avoir des échecs, comme les thés que je ratais systématiquement avant de prendre des cours de thé. Mais les succès sont délicieux. Cela vous motive à apprendre, à favoriser la qualité sur la quantité, à être concentré sur le moment de l'infusion et de la dégustation... En effet, le thé est surtout un breuvage très fin qui ne s'apprécie pleinement que dans un certain état de calme et d'attention. 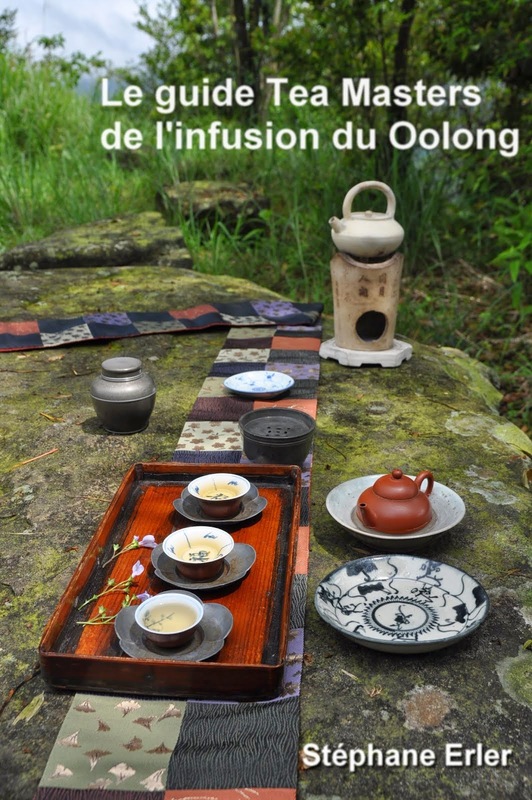 Mais un Chaxi reste un moment formidable pour transformer une simple infusion en un acte créatif, artistique en connection avec la nature (par les feuilles de thé et la plante qui ornera le Chaxi) et avec soi-même en êtant bien concentré sur tous ses gestes. Tant de portes s'ouvrent, les unes plus intéressantes que les autres. Pour suivre sa voie, il suffit alors d'aller vers la lumière! A tous les lecteurs déprimés par Sérotonine: au lieu de vous saoûler aux alcools forts, enivrez-vous de bons thés! Next week, the Chinese New Year of the Pig will start! In a few hours, I'll head south for the week long holiday. I'll be back on February 12th. Mes vacances du Nouvel An chinois ont débuté! Dans quelques heures je vais me rendre dans le sud de l'ile, puis à Taichung pour fêter mon animal chinois, le cochon! Je reprends le travail l'expédition de vos commandes le 12 février!